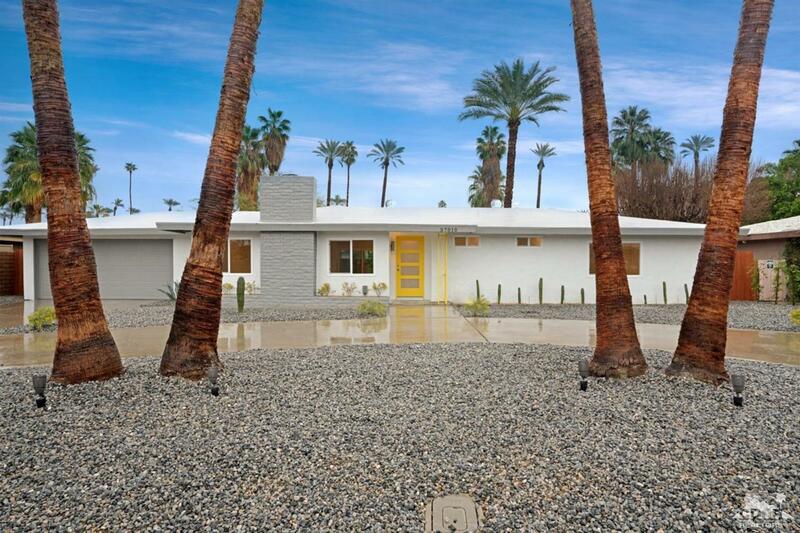 You must see this spectacular mid-century contemporary home in the highly desired Tamarisk area in Rancho Mirage. No detail was missed in this 3 bedroom, 2 bathroom home that has been completely updated to offer designer features for your enjoyment. Upon entering the home, through the stylish glass front door, you will fall in love with the open layout which has been tastefully finished with tile floors and a pleasing color palette. The family room features a stacked stone contemporary fireplace and opens to the dining area and kitchen. The kitchen has been expanded and features quartz counter tops with a waterfall breakfast bar, mosaic tile backsplash and ample cabinet space. There are new windows and sliding doors throughout and a new roof. The oversized private rear yard is a water efficient private oasis with a freshly pebble-tec free form pool & spa, plenty of sunshine and shaded patio cover offering the ultimate desert lifestyle!